Implementing BIM software across a company implies to communicate in-house procedures or best-practices to a potentially large audience. We also have to keep it mind than our public is generally not as proficient as we are with all this BIM stuff. Replacing text by pictures or even better, videos, can help deliver our message. This is where Autodesk Screencast can be really useful. Autodesk Screencast, formerly known as Autodesk Project Chronicle in the Autodesk Labs, is a screencast application specifically design for Autodesk products. It can support any application, but has an additional feature for Fusion 360, AutoCAD, Revit and Inventor. On these products, it can record not only the screen, but also every commands used during the session. These commands are displayed in a very convenient timeline, allowing the viewer to understand the process behind what is displayed on the screen. To record these command, Screencast install a plug-in in every selected Autodesk Application. Screencast comes as a stand-alone application, and can be launch from within your Autodesk product, directly in the Add-Ins ribbon. Once started, you can choose which application to record, fit its window to a correct aspect ratio and select if you also want to log keyboard events. You can even add to your video the sound coming from your microphone. After hitting the Record button, you can start your demonstration. Screencast will log every command you launch along with the screen cast, and show keyboard actions. This last part is especially useful for describing functions with specific keys, like rotating the view with the Shift key in Revit or Navisworks. At the end of your demonstration, you can edit your video, cutting out irrelevant parts or loading times to shorten our screencast. 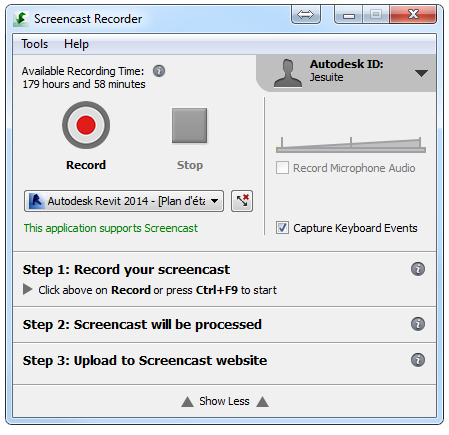 Once recorded and edited, the screencast is automatically uploaded to the Autodesk Screencast website. By default, the screencast is public, but you can restrain to on who have the link, or to a specific group of user with an Autodesk account. And the last but not the least, the video can be downloaded from the website. An URL is also provided to embed your screencast in a website. I’m usually not very fond of video tutorial, but I must admit than the Screencast application made the creation of such video too easy to miss. I will probably use it more to present my solutions.